Join us for one of five community meetings this week. If you are unable to make the meetings and wish to provide feedback to the work groups, please email steven.gallagher@minneapolismn.gov or ncr@minneapolismn.gov. The work groups will convene for their last meeting during the week of December 10. The City of Minneapolis will review the work group recommendations and provide responses to recommendations. The final work group recommendations, including responses from the City, will be released for public comment on January 14, 2019. The public comment period is scheduled to end on March 1, 2019. NCR is tentatively scheduled to present the Recommendations, including public comments, to the PECE Committee on March 18, 2019. Download the PDF version of timeline and meeting dates here. During the 45-day public comment period, NCR will hold two informational sessions. One will be held during the Community Connections Conference on February 2, 2019 and another will be held on Wednesday, February 27 (location to be determined). All Neighborhoods 2020 materials are available at http://www.minneapolismn.gov/ncr/2020. NCR staff are available to answer questions from any stakeholder throughout the entire process. 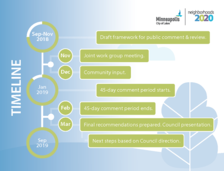 Neighborhood and community groups may request a presentation during the 45-day public comment period by NCR staff by contacting Steve at 612-673-2905 steven.gallagher@minneapolismn.gov. Neighborhoods 2020 is a community process to identify the next generation of neighborhood programming, funding and governance structure to support the City’s 70 neighborhood organizations starting in 2020 and beyond. Three work groups have been established to cover the major function areas of this work: programming and funding; governance; and citywide engagement policy. The work groups consist of representatives from neighborhood organizations, cultural groups, those with equity/undoing racism experience and representatives appointed by City Council and the mayor. The goal is to have policy recommendations to the City Council by January 2019.